Comments: Worth a listen if you're battling through Ivalice. I had the great experience of being able to experience White Melodies of Final Fantasy Tactics Advance for the “first” time twice. Shortly after the Japanese version of Final Fantasy Tactics Advance came out I got the White Melodies album and gave it a quick listen. I wasn't overly impressed and completely forgot about the CD. However, after 40 odd hours of playing the English version of FFTA I unearthed the CD again, gave it a good, long listen - well, as long as the CD is, anyway - and fell in love. It used to be a tradition for the Final Fantasy games to get some kind of arranged CD. These CDs usually took some of the songs from the game and arranged them in some fashion, recently done through orchestra, but Final Fantasy IV had the excellent Celtic Moon CD, in which all the songs were rearranged into Celtic music, while Final Fantasy V had the synthesized Dear Friends CD. Though this tradition has, sadly, fallen by the wayside, White Melodies harkens back to those CDs. Most likely a cheaper option than a full orchestra arrangement, White Melodies uses some synth, some acoustic guitar, and piano, along with a little bit of horns, to make a very relaxed, easy-listening CD. Does it seem counter-intuitive to take action/battle themes and make them into easy-listening music? It did to me, especially before I really got into the game. But even after a cursory go-through of the game’s narrative themes - admittedly simple, but sincere - the music fits very well. The CD starts out with the laid-back Magic Beast Farm (Bandneon version), which features the style of guitar and synth melodies that pervades the CD. The melody is pure FFTA, but weaves it into something much more sincere and refreshing than the in-game music. Track two, Different World Ivalice (Piano version), a take on the game's overworld theme, features mostly piano, and in that regard is reminiscent of the Final Fantasy Piano Collection CDs that nearly every Final Fantasy game has been blessed with, but use of some synth as the song progresses changes the whole context. Most of the CD follows the style of one of the first two tracks. It's hard to rate individual tracks, because obviously the CD is meant to be taken as a whole; the similar sound and feel to all the tracks suggests this. A couple of tracks do stand out a bit for various reasons. Track four, Mewt, is an absolutely beautiful acoustic guitar and drum piece. On a beautiful CD, it's possibly the most beautiful song. Track six, Marche (Love for Humanity Version), has gorgeous use of horns, while Beyond the Wasteland is a amusing rendition of one of the game's battle themes. The Place We Should Return to (Invincible version) is another sincere track along the lines of four and six. 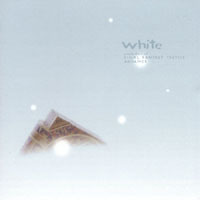 Without a familiarity for the tracks as they are played in the game, White Melodies seems like a one dimensional CD. However, after some game play, the way Yo Yamazaki, Akira Sasaki, and Satoshi Henmei weave the games’ melodies into these simple, but sincere and beautiful little songs. The songs feel very uplifting and spirited in their new garb. The “easy listening” clothes that these songs wear certainly isn't for everyone, but I find that I've fallen head over heels for it. Less subjectively, the CD is ridiculously short. It clocks in at 46 minutes with eleven tracks. However, the character of the CD suggests that with any more tracks the CD would have felt pretty indistinct. Practically, the people arranging this CD didn't have much to work with anyway; Final Fantasy Tactics Advance is short dozens and dozens of tracks compared to even the Playstation Final Fantasy Tactics title. This CD certainly isn't for everyone. But if you're playing, and enjoying, Final Fantasy Tactics Advance, it will be well worth your time to give this CD a spin. Maybe you'll adore it as much as I do.